It’s that time of year again: Spring Cleaning! organize a home – while dressing it up with photos. If your mudroom is like ours, what starts out as a very organized space where everyone has a compartment very quickly turns in to the wild, wild west. Mark your territory with Canvas Hanging Prints. Not only is it a fun and functional way to maintain organization, but it’s also beautiful. In warmer months when coats and jackets may be put away, it becomes a fun way to display photos. With our new Canvas Hanging Inserts, you can keep the photos in your Canvas Hanging Prints up-to-date by simply removing the existing photo from the magnetic frame and replacing it with new inserts. Your most important memories deserve the very best. Organize and protect your memorabilia and knick knacks in a Wooden PhotoBox. Currently available in two sizes (4×4 and 8×8), PhotoBoxes are constructed of high quality maple and include a removeable printed lid. A new PhotoBox size will be released in the coming weeks that will be perfect for gathering memories: our 9×13 PhotoBox. It will be available in 2.5″ and 4.5″ depths. This new addition will be our largest PhotoBox and will allow enough space for a standard sheet of paper (8.5×11), 8×10 prints and more. Whether you’re gathering wedding memorabilia or baby keepsakes, PhotoBoxes are a beautiful way to organize your memories. Print a picture of each of your children on a Wooden Photo Magnet and use it to hold up their latest art work, report card or reminders. A simple way to declutter and organize your fridge. Magnets are available in four different shapes, all 3.25″ x 3.25″. How long has it been since you’ve updated the photos on your wall? Get those photos off your phone and create a PhotoCrate gallery wall. PhotoCrates are available in sizes from 5×7 to 11×14. The slot in the top makes it simple to swap out photos – so you can easily keep your gallery wall current. 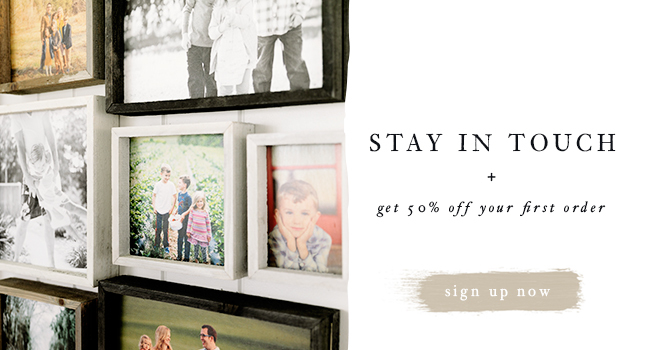 PhotoCrate frames are available in barnwood, white and black. Choose to print your images on wood, paper or canvas. PhotoCubes and PhotoBlocks are a great way to organize spaces in your home. Spell out a child’s name such as ‘Chloe’ or ‘Jane,’ label a room like ‘Playroom’ or ‘Reading Nook,’ or even a wedding date on a shelf with memorabilia. Keep the images around your home fresh and current with two of our newest products: Hanging Canvas Prints and PhotoCrates. We just recently released Hanging Canvas Inserts that allow you to purchase refills for your Hanging Canvas Prints. PhotoCrate inserts are also coming very soon.